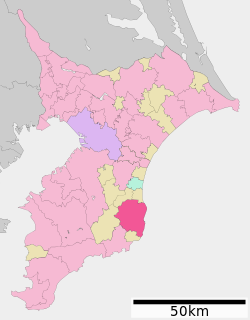 Isumi-shi / いすみ市, located on the east coast of Bōsō Peninsula of Chiba Prefecture, whose name written only in Hiragana today, is not so known. Most of you may know that three types of letters, Kanji / 漢字, HiraganaW / ひらがな and KatakanaW / カタカナ, are used in Japanese language. Kanji, literally meaning “Characters of Han dynastyW”, have meanings as well as sounds. On the other hand, Hiragana and Katakana are both syllabaryW which only represent phonemes and have no meanings. If you start to learn Japanese language, we believe that getting to know Hiragana and Katakana will be your first step of learning the language. The next step would be getting to know the Kanji which is pretty difficult but once you are familiar enough with Kanji, it should be easier and faster to understand what is written, even if you ever come up to the Kanji you’ve never seen before, you would be able to imagine what meanings and sounds that the Kanji has by its assembling shape. Joking aside, considering why some cities had to count on Hiragana for their new names, it could be because they wanted to make the new names sound flat, simple, and easy to understand by using no Kanji, which refers also to some meanings, in order to avoid any conflict. The beginning of Isumi is likely to have started when the dawn of Japanese history when Shinto gods of Izumo were not yet the characters of myths…. Picture from Wikipedia. For the sake of the respect to the area, we would now like to share the history and the meaning of Isumi-shi which also chose its new Hiragana name. We can trace the origin of this area in one of the ancient document, Nihon ShokiW, the chronicles of Japan, with the name ‘Ijimi / いじみ’ written in Kanji as ‘伊甚’. Surprisingly, we can trace a very old shrine named ‘Ijimi / 伊甚’ in Shimane prefectureW which was called ‘Izumo provinceW / 出雲国’ until Edo periodW. The province had been a very important area since the dawn of the Japanese history as the top ranking Shinto shrine (though this system was abolished in 1946), ‘Izumo-taishaW / 出雲大社’ is located. Some people say this is a proof that these two towns are connected from the ancient times and that the people of Izumo came to construct the land of Ijimi country. Later, in Edo period, Tokugawa shogunateW sent one of their Four Paladins, Honda TadakatsuW as the ruler of this area because the land was recognized as an important food supplier for Edo. There were farms which provided rice and vegetables, together with the ocean which provided fish. Therefore, this area was very important. However, Tokugawa shogunate was so defiant, mean and perverse that they named this area ‘Isumi / 夷隅’ literally meaning ‘Barbarian country on the extremity’ to contradict its importance. 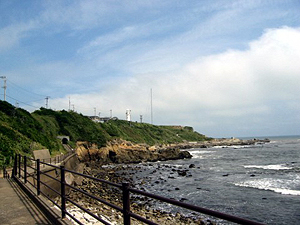 Promenade along Cape Inubo. Suitable place to visit especially in summer. These famous places above are absolutely the ‘must’ for beginners of travelling in Japan. Since there are tons of sites and guidebooks introducing these places, we will leave the informing to them and introduce you to the out‐of‐the‐way place where you could experience interesting and exciting, REAL Japan. 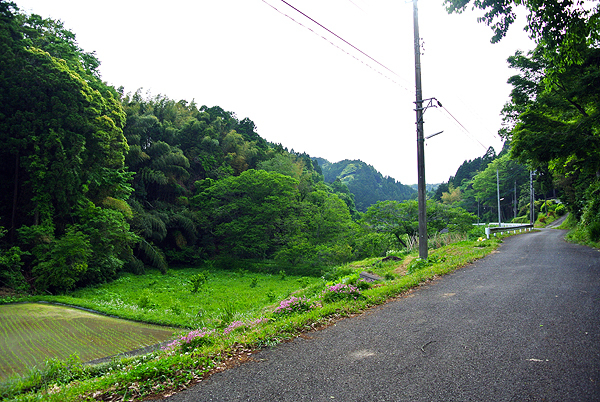 The landscape of Isumi should remind you of Totoro’s woods of Hayao MiyazakiW’s ‘My Neighbor TotoroW’…. This surely is the landscape scene of the Japanese heart. In fact, it was a cheese which brought us here. It was in Michi-no-eki ‘Miyoshi-mura’ where we have found some locally made cheeses which interested us and made us look over the information, found that Isumi-shi had five six cheese makers. Later, we would like to introduce these small cheese makers who make cheese with their raising cows’ milk in their farms. 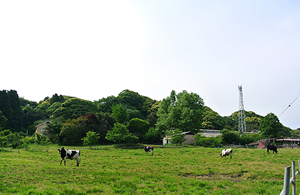 Dairy farms, more occidental, can also be found in Isumi where good local cheese are produced. Isumi-shi has a very beautiful scenery. You can enjoy both the ocean view and the relaxing landscape of rice fields on the hills which reminds us of the world that Hayao MiyazakiW creates. Talking to people of Isumi would remind us of every enjoyment that the rich nature of Isumi offers. One of them at this time of the year is surely the fireflies watching. 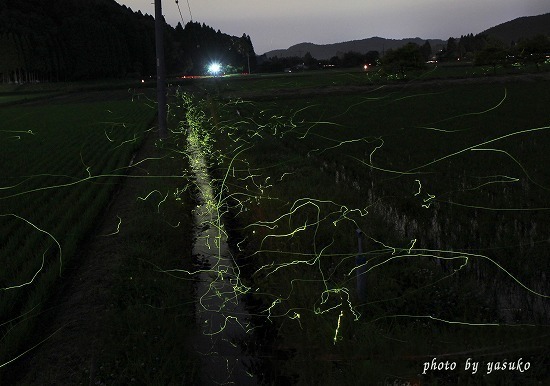 Fireflies dancing in the evening of Yamada, Isumi, a wondrous scene you could enjoy in the countryside, rich in nature. Photo from ‘roses-no-blog‘, a personal private blog introducing happy life living in Isumi. For those who want to get informed on Japanese culture of admiring fireflies, please refer to our past article “Land of Fireflies, Isshiki“, written about the place you could see fireflies in Yamanashi prefecture. 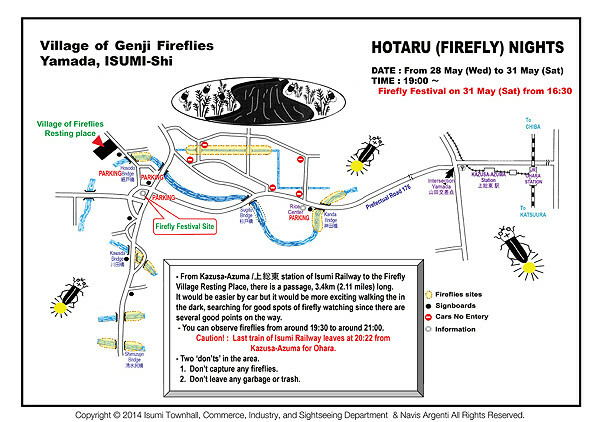 Here is the map for firefly watching in Isumi-shi. Firefly watching guide map of Yamada area, Ishumi. Firefly Festival is held this weekend, on 31st May 2014 from 16:30. 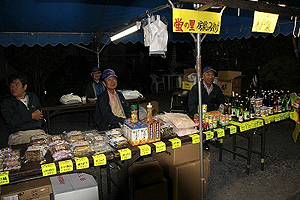 Fireflies can be still seen after the festival, until about mid June. Map from Isumi City Official Site. **Cilck the image for larger image. If you are lucky enough to be in Tokyo from the end of May to early June, we strongly recommend you to go for firefly watching. Once you experience, we bet you would seek for another place for your firefly watching on your next visit! People gathering at FIrefly Festival in Yamada area, Isumi. Photo from ‘roses-no-blog‘. On 31st of May, Firefly Festival will be held in the area. It would be a good occasion if you have never seen fireflies before and easier to find where they are as many people gather for them on the day. Otherwise the area is very dark where you would easily drop your foot into the paddy field if you don’t know the right way. 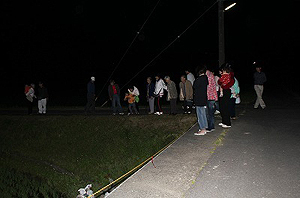 Most of all, best viewing spots for beginners would be directed in such events. Souvenir stools selling local products appear during this period.Photo from ‘roses-no-blog‘. The ecology of fireflies can be observed only in places where the nature is perfectly protected and the water is absolutely clean. This definitely proves the cleanliness of the nature in Isumi. Fireflies are proving the rich and fabulous nature that has long been of the landscape of the Japanese heart! Take Keiyō_RoadW or Higashi-Kantō ExpresswayW at Soga I.C. which are connected. Next, take Chiba-Tōgane RoadW and Togane Kujukuri Toll Road / 東金九十九里有料道路 and then Kujukuri Yuryo Doro / 九十九里有料道路. After driving to the end of the toll road, take National Road 128. Of course, you can reach Isumi by using Aqua Line. At the end of Aqua Line, continue driving Tateyama Expressway to Kisarazu-kita / 木更津北 I.C. Take National Road 409, then take National Road 297. 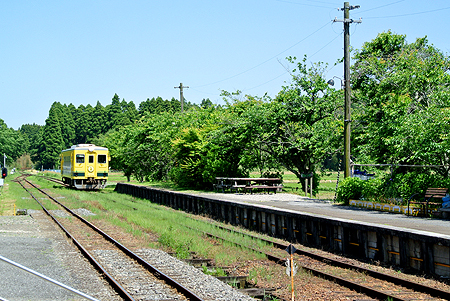 There are parking lots near the Kuniyoshi / 国吉 and Ootaki / 大多喜 stations of Isumi Railway where you could park your car and enjoy a ride on the fancy, cute Isumi Railway trains through the rice fields and rich nature of Isumi on a track. There are three ways by train to Isumi. Cute little Isumi Railway train! Take JR Wakashio Line which would take you to Ohara /大原. Take JR Sazanami Line or JR Keiyō LineW and get off at Soga /蘇我. Transfer to Sotobo Line which would take you Ohara /大原. Take Chūō-Sōbu LineW to Chiba and transfer to JR Sotobo Line to Ohara / 大原. Isumi Railway train runs into the greens and through the beautiful nature of Isumi. Feel as though riding on the Catbus of My Neighbor TotoroW! From Ohara / 大原, take Isumi Railway to explore the area. 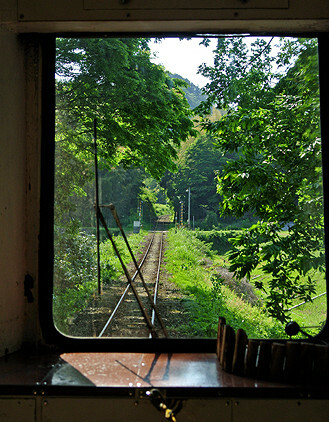 We will be introducing a small trip on Isumi Railway in our next article here, at 2 Hours Drive From Tokyo!